London, United Kingdom – 20th February 2018 – Nintendo game enthusiasts, today Super Rare Games announces the launch of its first limited run physical production of Curve Digital’s indie smash hit Human: Fall Flat for Nintendo Switch™. Due for release in early March, this will be the first release in Super Rare Games’ lineup of physical indie game releases exclusively on Nintendo Switch™. Producing just 5,000 copies per title, Super Rare Games puts quality over quantity, and its physical editions of successful indie titles will feature beautifully printed packaging and high-quality trading cards. These cards will be blind-boxed, with just 125 signed by members of the game’s development team, making them highly collectable - a must-have for any indie enthusiast! For Human: Fall Flat, the collectible cards will be signed by the game's creator, Tomas Sakalauskas. 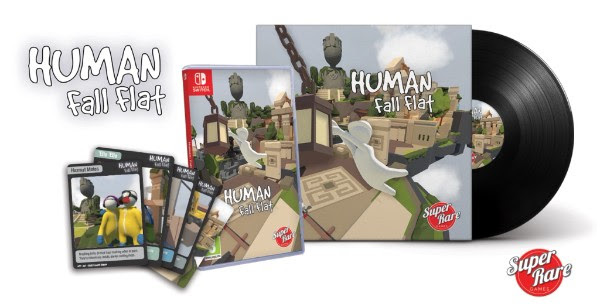 Super Rare Games is also producing an extremely limited run of just 500 copies of the Human: Fall Flat soundtrack, printed on to 12-inch vinyl. Human: Fall Flat launched onto the Nintendo eShop on December 7th, 2017, and recently surpassed two million sales worldwide, fast becoming a favourite of YouTuber and Streamers due to its hilarious, slapstick, co-op comedy. Human: Fall Flat is a is an open-ended, physics-based puzzle game in which you take control of Bob, helping him resolve the mysteries behind his recurring dreams of falling. Pre-orders are live at www.superraregames.com now - reserve your copy today to avoid disappointment!